In the midst of the redecoration I have found the time to do some little make over projects of my own, much to Nick’s dismay! 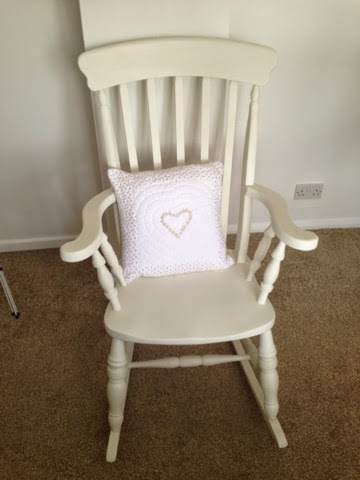 The first was to paint the rocking chair for the baby’s nursery. We are having a pine chest of drawers and wardrobe but they baby’s cot is white and I want the rocking chair to match this. I purchased the rocking chair from ebay for £36.00. It looked like this. 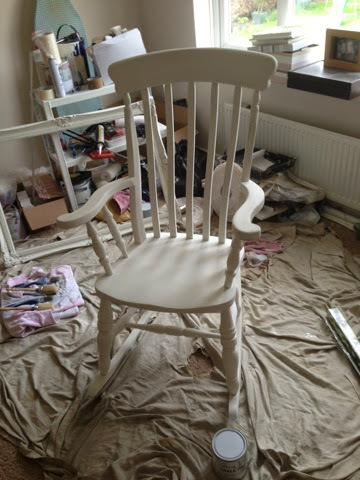 I painted it in Annie Sloan Chalk Paint , the colour was Old white. Two coats gave enough coverage so I then waxed it.